With No. 16 University of Maryland Baltimore County’s historic upset against No. 1 Virginia to the never-before-seen scenario (since seeding began in 1979) where the top four seeds of a bracket failed to reach the Sweet 16 (South), we’ve already witnessed the most shocking NCAA tournament ever. By now you’ve seen the remaining teams examined, dissected and hypothetically re-seeded. But how would the seeds look if based on the NBA careers of players who hail from the 16 schools? We offer that to you, complete with the most talented player from each school, and a historical starting five (based on their NBA careers). 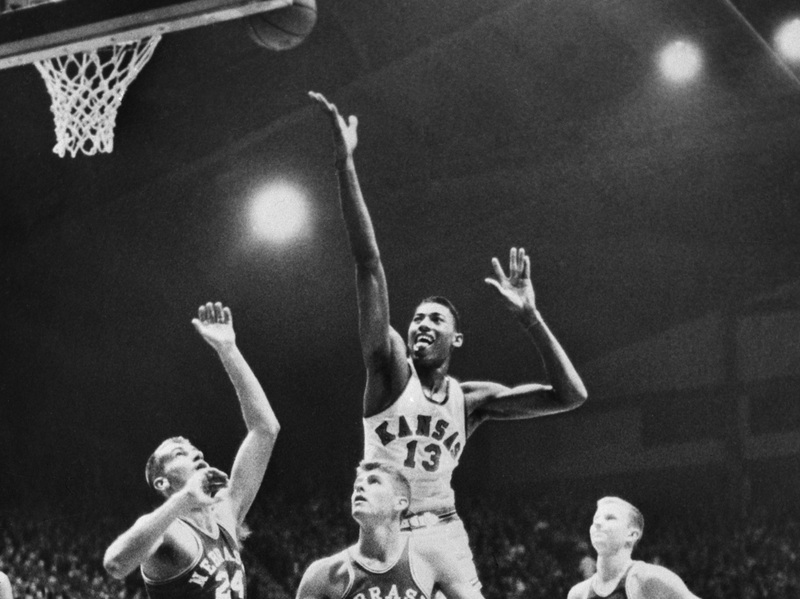 Kansas center Wilt Chamberlain goes for a rebound over Ron Parsons (No. 24) and other Nebraska players during a Big 7 Conference game on Feb. 25, 1957, in Lawrence, Kansas. SCOUTING REPORT: The presence of Chamberlain alone — the only NBA player to score 100 points in a game, and the only player to lead the league in scoring, rebounds and assists in a single season — makes this the team to beat. The backcourt with current and future Hall of Famers (White and Pierce) has great balance. Never heard of Lovellette? He’s a three-time NBA champion and a four-time NBA All-Star who was the first to play on teams that won an NCAA title (1952, where he was also the Most Outstanding Player), an Olympic gold medal and an NBA title. Bolstered by a long bench featuring Danny Manning, Drew Gooden, Andrew Wiggins, Kirk Hinrich and Mario Chalmers, the Jayhawks are the overwhelming favorite. Michigan’s Chris Webber rips one down in front of Oklahoma State’s Corey Williams during the first half of a Southeast Regional game at Rupp Arena in Lexington, Kentucky, on March 27, 1992. SCOUTING REPORT: Webber’s ability to score and board (20.6 points per game, 9.7 rebounds per game in his NBA career) and the toughness of five-time NBA All-Star forward Tomjanovich are perfect complements to Tarpley holding down the middle. Rice and swingman Russell round out the top five with help from the bench that includes Jalen Rose, Jamal Crawford and Juwan Howard. Anthony Davis of the Kentucky Wildcats drives around Justin Hamilton of the Louisiana State University Tigers during play at the Pete Maravich Assembly Center on Jan. 28, 2012, in Baton Rouge, Louisiana. Kentucky won the game 74-50. SCOUTING REPORT: Anthony Davis gets front-line support from the tough-as-nails Issel, one of the game’s original stretch-4s. With Rondo running the offense, Wall needs to adjust to playing without the ball in his hand all the time. Strong bench includes Jamal Mashburn, Tayshaun Prince, Antoine Walker, Devin Booker, Rex Chapman and Cliff “Li’l Abner” Hagan. 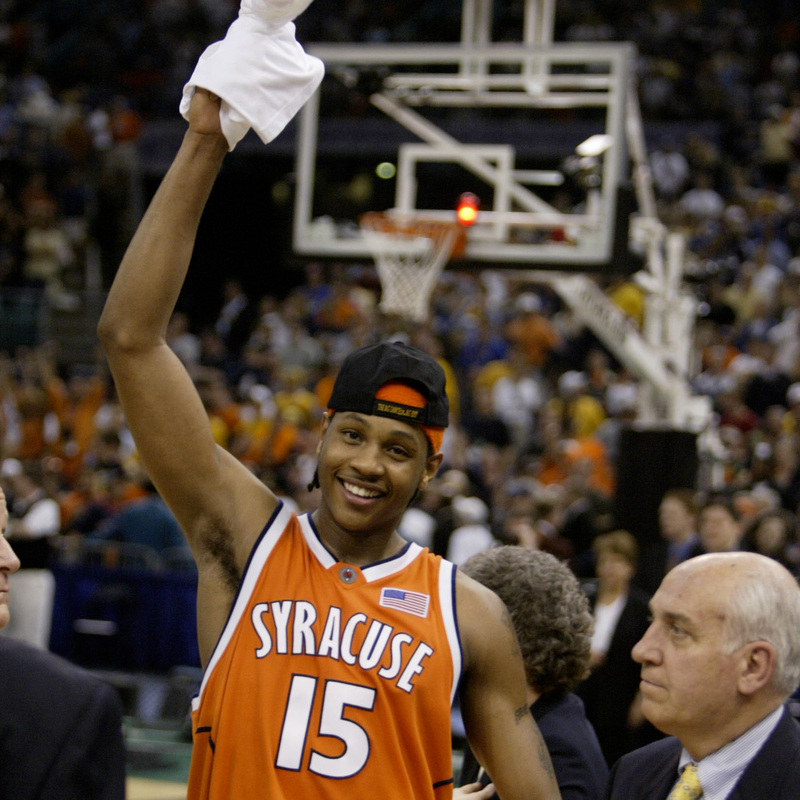 Syracuse’s Carmelo Anthony against Kansas during the championship game of the NCAA Final Four at the Superdome in New Orleans on April 7, 2003. SCOUTING REPORT: This team has two NBA scoring champions in Anthony and Bing. 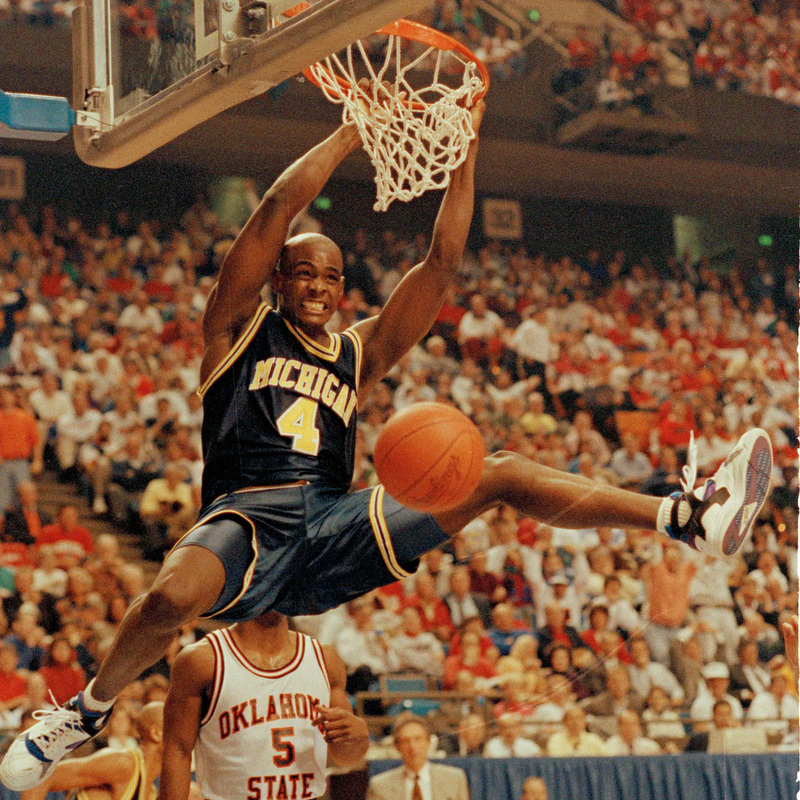 One of the most versatile forwards the NBA’s ever seen in Coleman, who scored inside and out and pounded the boards. A center who held his own against all comers in Seikaly. The bench is good but not great, with Dion Waiters, Sherman Douglas, Louis Orr and the late Pearl Washington. Duke’s Grant Hill leaps for the hoop during practice for the NCAA Southeast Regional basketball tournament at the ThunderDome in St. Petersburg, Florida, on March 17, 1994. SCOUTING REPORT: Expect Irving to one day emerge as the greatest player in Duke history, which will be quite the accomplishment considering Hill’s amazing talent until injuries curtailed his career. Boozer and Brand are indicative of quite a few Duke bigs: great college players who were merely good in the NBA. Quite a long bench with Christian Laettner, Luol Deng, Corey Maggette, Brandon Ingram and Mike Gminski. Just not championship-caliber here. 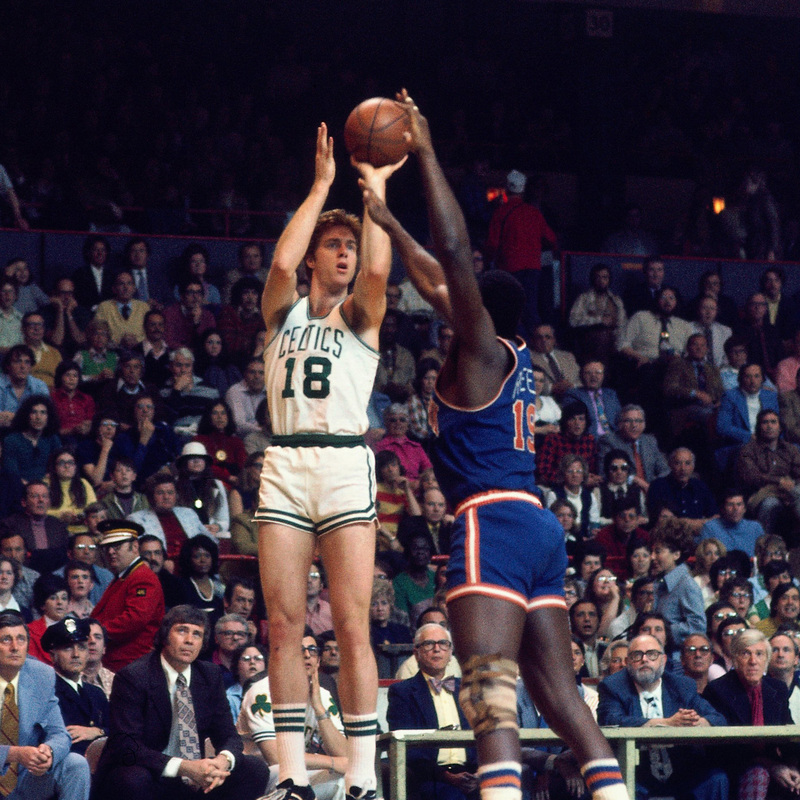 Dave Cowens of the Boston Celtics shoots over a New York Knicks defender during the 1973 Eastern Conference finals at the Boston Garden in Massachusetts. SCOUTING REPORT: Cowens was listed at 6 feet, 9 inches, and that’s questionable. Regardless of height, his credentials were legit as a stretch-5 (Rookie of the Year, league MVP and a spot on the NBA’s 50 Greatest Players list). Lots of solid guards, led by the brilliant basketball mind of two-time NBA champion Cassell. But the lack of size and lack of a deep bench prevent a deep run. 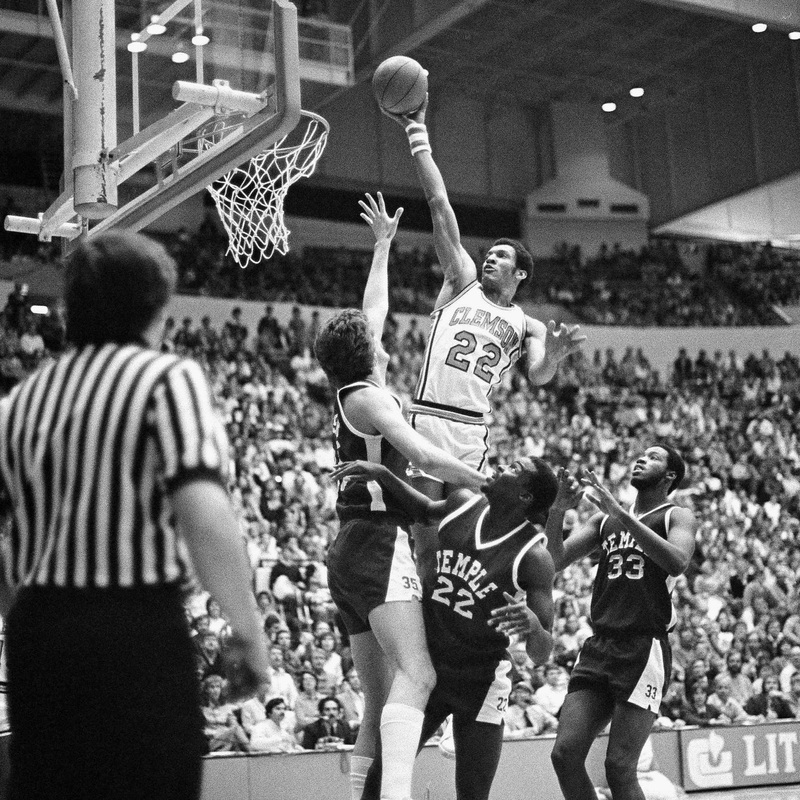 Larry Nance of Clemson gets above Temple players Ron Wister (No. 35) and Kevin Broadnax (No. 22) for a basket during a first-round game of the National Invitation Tournament on March 12, 1981, in Clemson, South Carolina. SCOUTING REPORT: Deepest front line in the field, led by Nance (17 points, 7.9 rebounds per game in his NBA career). Grant contributed to four NBA titles. Davis is high on the list of NBA players you didn’t want to flex on. But the lack of quality guards limits this group’s success. 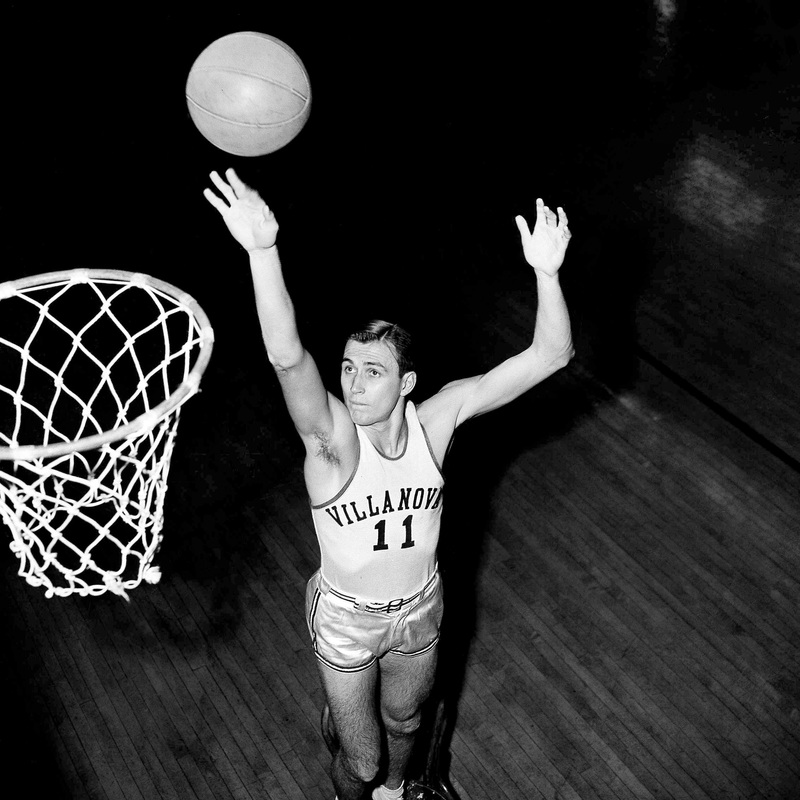 Paul Arizin of Villanova, shown March 7, 1950, topped the voting in the 1950 Associated Press All-America collegiate basketball team. SCOUTING REPORT: Hall of Famer Arizin was one of the best scorers of the 1950s (he averaged 22.8 points and retired with the third-best scoring average in NBA history). A decade later, Washington was beginning his solid pro career in which he averaged 10.5 points per game while playing as a 6-foot-7 center. A lot of good NBA players off the bench with Doug West, Ed Pinckney and Rory Sparrow. 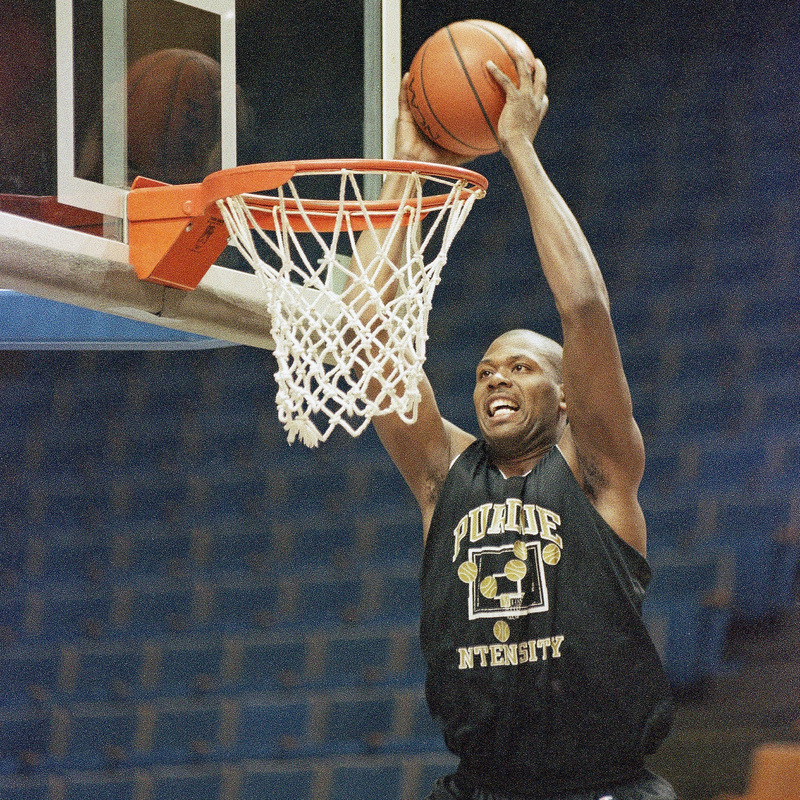 Purdue’s Glenn Robinson shown during NCAA practice on March 16, 1994. SCOUTING REPORT: Forget the moodiness that kept Robinson from getting the respect he deserved during his NBA career. His jumper was picture-perfect, helping him to average 20.7 points per game over his career to go with 6.1 rebounds. Robinson is forced to carry too much of a burden in this scenario. Carroll will post numbers, and Miller provides toughness. But with no impactful guards, this team would have trouble getting into its offense. 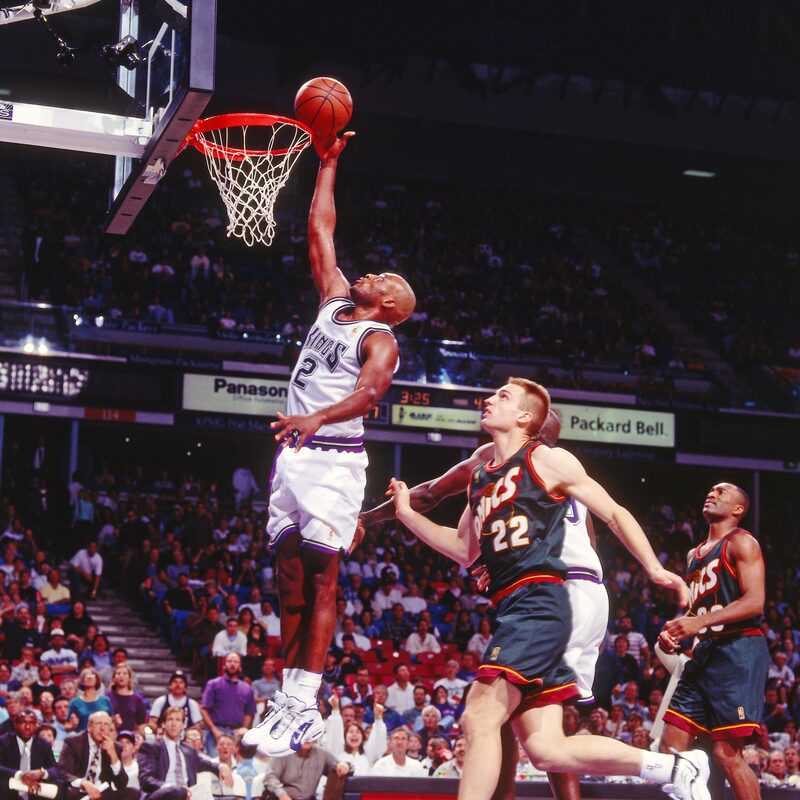 Mitch Richmond of the Sacramento Kings shoots against the Seattle SuperSonics circa 1996 at Arco Arena in Sacramento, California. SCOUTING REPORT: Richmond (Hall of Fame, 2014) could get any shot he wanted in averaging 21 points per game as a pro. Blackman averaged 18 and was the top scorer in Dallas Mavericks franchise history until his record was broken by Dirk Nowitzki. Points matter, and occasionally Beasley might offer some assistance. But not enough consistent firepower, especially off a thin bench. 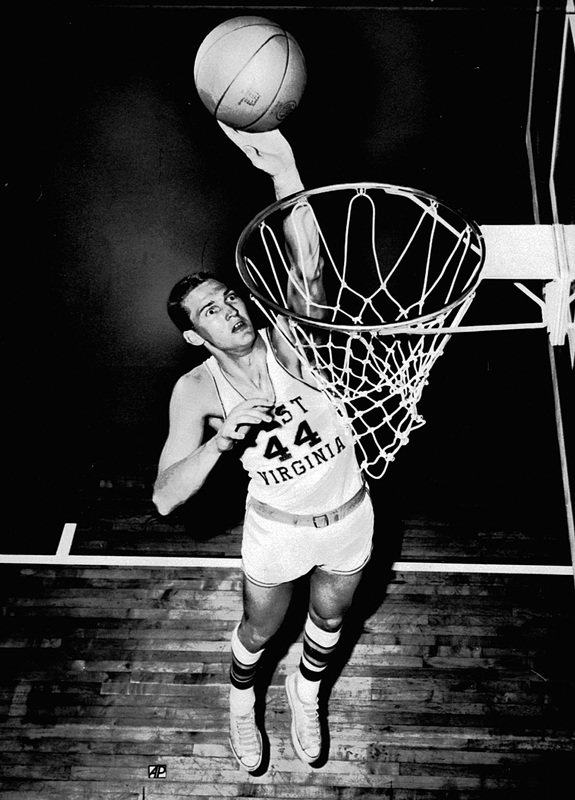 In this 1959 file photo, West Virginia University basketball star Jerry West takes a practice shot. SCOUTING REPORT: Listen to West and you wonder how such a pleasant man could have been such a cold-blooded assassin. Whether it was scoring or defense, this NBA champion, scoring champion, 14-time All-Star and four-time All-Defensive first-team member lived up to his “Mr. Clutch” nickname. Unfortunately, this team has no size and no depth, giving it no real chance. 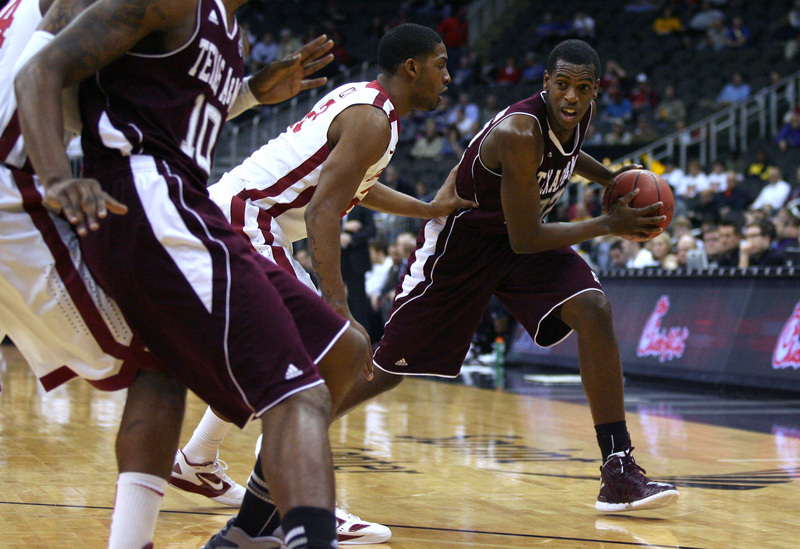 Khris Middleton of the Texas A&M Aggies looks to pass through the Oklahoma Sooners’ defense during the first round of the Big 12 basketball tournament on March 7, 2011, at Sprint Center in Kansas City, Missouri. SCOUTING REPORT: Beyond rim protector Jordan, there’s not a lot here. No high-scoring guard, no bench, no chance. 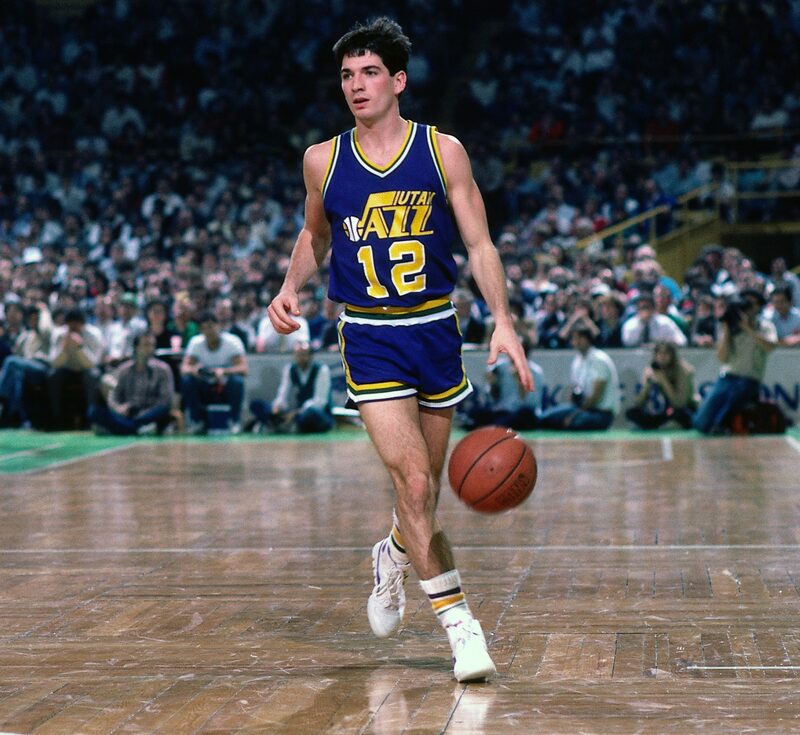 John Stockton of the Utah Jazz dribbles during a game circa 1986 at the Boston Garden in Massachusetts. SCOUTING REPORT: Stockton is, by far, the most popular player in Gonzaga’s history and emerged as one of the premier point guards in the NBA. Besides Stockton, the lack of experience prevents a deep run. Too bad NBA Adam Morrison never resembled college Adam Morrison. 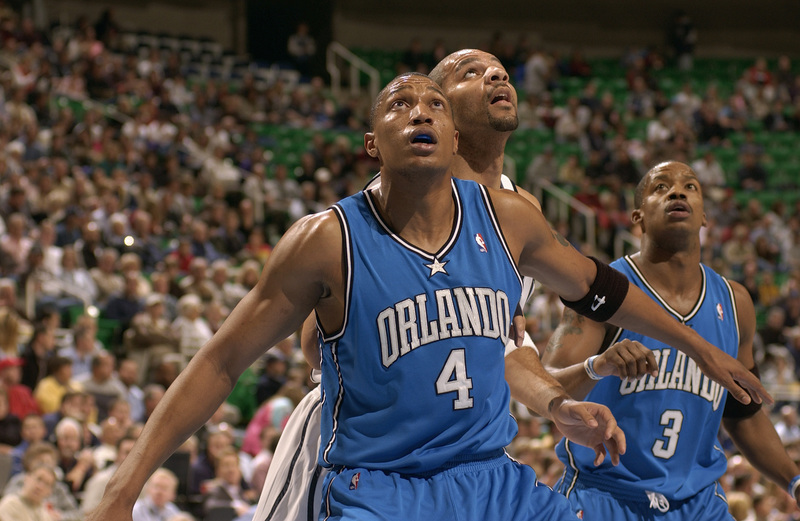 Tony Battie (No. 4) and Steve Francis of the Orlando Magic attempt to catch a rebound over Carlos Boozer of the Utah Jazz during a game on Dec. 8, 2004, at the Delta Center in Salt Lake City. SCOUTING REPORT: As the youth might say: Slim. Pickings. Which is shocking because you would think the school would have developed more NBA talent. Not a single Texas Tech player who has reached the NBA has ever averaged double figures. If you can’t score, you can’t win. 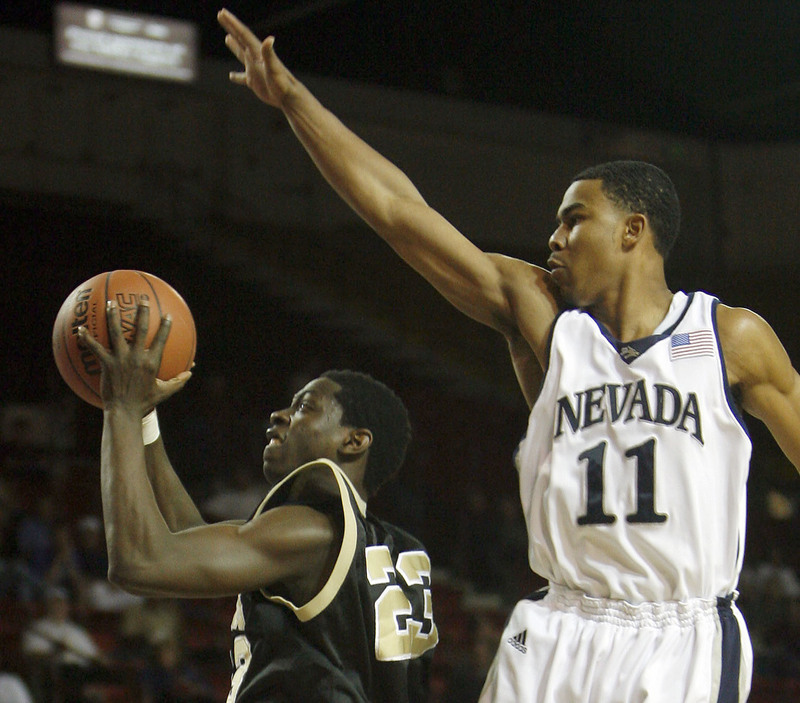 Nevada’s Ramon Sessions blocks a shot by Idaho’s O.J. Ovworro during the WAC men’s basketball tournament in Las Cruces, New Mexico on March 8, 2007. SCOUTING REPORT: The total number of Nevada players ever drafted into the NBA is eight. Kentucky does that in two years. No, Nevada has never been a basketball factory. And, in this scenario, it’s “In JaVale McGee we trust.” Too much of a load for the NBA champion backup center and Washington Wizards backup guard Sessions, who is playing with his eighth team in 10 years. There is no No. 15 vs. No. 2 upset here. SCOUTING REPORT: Let’s start by putting some “Respek” on Loyola’s name. The school started four black players during the 1962-63 season, breaking a “gentlemen’s agreement.” Of course, the season ended with the school’s only NCAA national championship. That said, you have to go back to 1949 to find the player, Kerris, with the most NBA success. The school’s second-best player? That’s LaRue Martin, who is often mentioned as the worst top draft pick in NBA history. So the chances of getting out of this field? Impossible.